Dorset People is all about introducing you to the people who make Dorset special. Each has been hand picked because they are #DorsetToATea. This time we are on the high seas with Emma and Clem on Wild Frontier. We are both West Country through and through. Clem born in Portwey Hospital, Weymouth. Me in Freedom Fields, Plymouth. Clem has always been at sea. He didn’t care for school and would go out mackerel fishing before classes started, then be so tired he’d be asleep during the lessons. Teachers appreciated the odd lobster he could give and turned a blind eye, but it was clear he wouldn’t stay in academia. 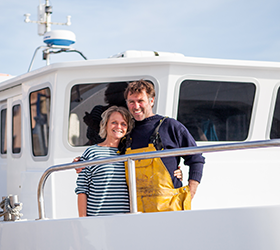 He started a life on the trawling fleet out of Weymouth and took his first trip deep-sea commercial fishing aged 13. He had found his groove! He is happy beyond the land and is not romantic about the conditions that it is necessary to overcome but with the life brings a sense of spaciousness, of freedom and a deep understanding of nature. I think this is something we as humans long for – something ‘beyond’ ourselves and in Dorset we are blessed with so many opportunities to immerse ourselves in wild space. We never take this for granted and are thankful every day! We’re inspired by nature – particularly the ocean; its rhythms, the hidden lives it supports and how we can learn from its gentle ebb and flow and ability to continue ‘breathing’ and existing whilst there is chaos elsewhere on the planet. Living on Portland, the sea surrounds us – we hear the waves from our home and I can hear Clem returning from a day at sea if the wind is in the right direction – these small things matter to us! If we could be any Dorset Tea, I’d be Ginger and Sunshine Lemon – invigorating and zingy and full of optimism – it’s a happy tea! Clem is 100% Cool Camomile – pretty damn cool and so laid back, it hurts! A flask, with my border collie on the clifftops between Church Ope Cove and Durdle Pier. If you close your eyes, drinking Wild about Mint feels like you are taking a mouthful of pure seaside living. I love the ceremony of laying out my anorak to share with my dog, Skipper, and gazing out to sea wondering which shipwreck Clem is fishing and trusting he is having a good day! Realising that this place is where we are supposed to be – truly supposed to be! And sharing it daily with like-minded others – this feels great and is a blessing! Book a fishing trip aboard our purpose built catamaran operating daily form Weymouth Harbour at www.wildfrontiercharters.co.uk . Bathe in sunsets with a cuppa on Chesil Bank looking west to Lyme Regis and making up stories of pirates and swag. Clembo is the best fisherman in Weymouth he knows his stuff !!! Totally the coolest couple. At " one" on Portland. Our own Popeye and Olive Oyl.